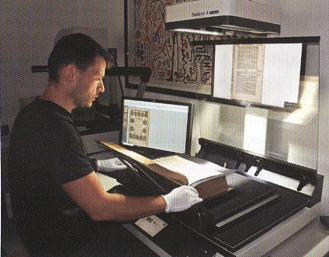 The digitization of 1,600 pages of the original Luther Bible from the year 1545 demanded not only the highest sensitivity and calm hands of the operator, but also the best scanner on the market for preservation of books, the Bookeye® 4 V1A Professional. The Luther Bible is a translation of the Old Testament from the ancient Hebraic and Aramaic as well as the New Testament from ancient Greek into early modern High German. This bible edition has been verified as the “last hand edition”; the last version which Martin Luther personally reviewed and approved before his death in 1546. The invention of the printing press by Joseph Gutenberg made mass production and distribution of this bible in the German language. Silvia Meier, Commercial Director of the Frankfurt Bible Society: “We have received the Bible as a loan and it is of particular importance to us as Luther’s historical work. 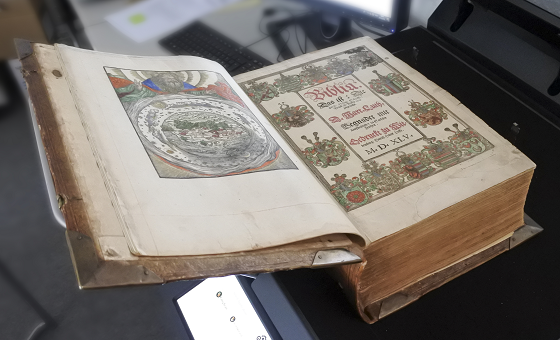 Above all, the sensitive handling of this valuable book was important to us. We are very confident in both the quality of scanning and the speed with which the project could be carried out, and we would like to express our gratitude to Image Access for the successful cooperation. In the course of the project, two more historical books were also digitized. One is a children’s picture Bible by Johann Matthias Bansa, particularly interesting due to the copper engraving process, in which the image to be printed is “dug” into a copper plate and the resulting lines then take on the color which is pressed onto the paper.The second is the unique piece of a hand-written Ethiopian hymnal the property of the Ethiopian imperial family.